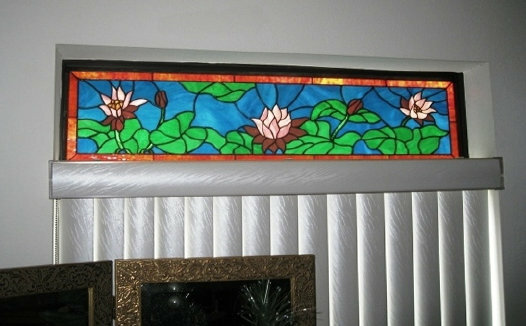 Carol Ann and her husband called me about building a set of water lily transoms for their home outside of Houston. I have never attempted water lilies, but Carol Ann sent along some good examples, so I took on the challange. 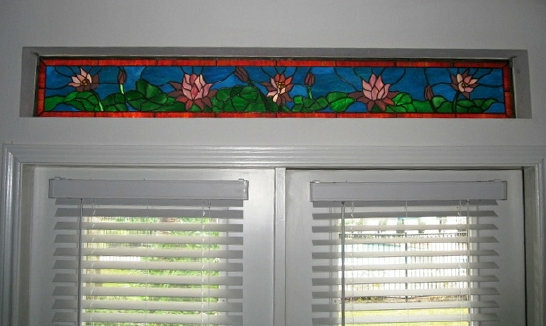 Her husband had built stained glass before, so I knew I had to measure up to the standards of an experienced glass guy. The transoms to the right are the result of our collaboration. The transoms were to go in the same room so it was important that the colors match but the sizes were different so we had to create two different but similar designs. Carol Ann was gracious enough to send photos after her husband installed the transoms. 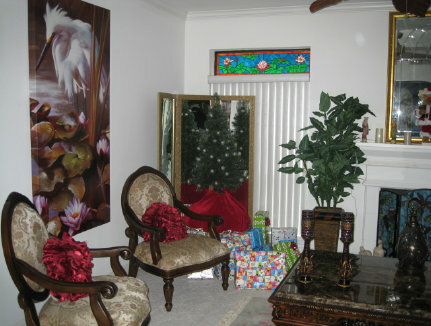 Note the water lily fireplace screen and the water lilies in the artwork on the wall. She told me up front she loved water lillies! What a beautiful home! 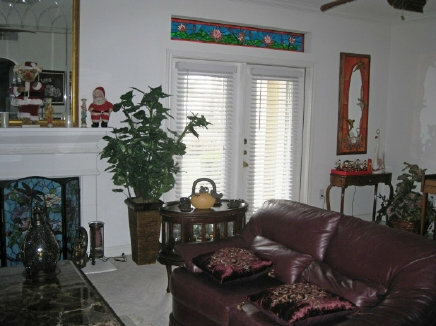 Carol Ann's Transoms were completed in November, 2011. One measures about 71 5/8" x 9 5/8" and contains 221 pieces of glass and the other measures 45 1/4" x 11 1/4" and contains 168 pieces of glass.